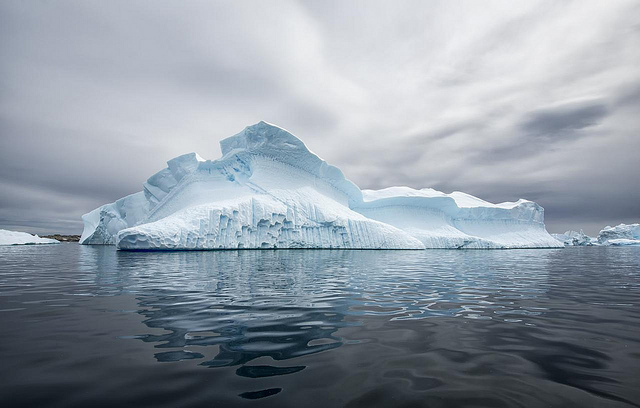 Photo Credit: Christopher Michel, published under CC. Working for a large company or corporation as an employee has certain benefits. The pay is good and there’s usually room to change jobs – without having to update your resume or going for a job search. Much the same goes for selling your training services to large companies and corporations. Once you’re in, you get paid decently and there’s always more work. But how do you get in? How do you market your training business to large companies and corporations? Here are 5 tactics to get you started. If you’re a very small training company, you may be tempted to project a much bigger image, or simply to pretend you’re a big company. After all, this is very easy nowadays. Just create a very well designed, very professional looking website. Use a phone answering service. Say ‘we’ all the time instead of ‘I’. But don’t fool yourself, if you actually start working with a customer, they will find out your company’s size at some point. Besides, if they ask you directly “How many employees does your company have?” – and some customers will ask you exactly that – what are you going to do? Lie about it? Big corporations who are willing to cooperate with individual trainers or small training companies don’t care about a ‘big’ image. They’ve already weighed all the pros and cons. So, be upfront about it and put your picture on your website. Because by introducing a human element, you’re actually turning a self-perceived weakness into a strength. You’re not some large training company where the customer never knows who the trainer is going to be for the next training. Your customer will actually get to know you. They will even get to rely on you personally. Photo Credit: Drew Avery, published under CC. To gain the trust of bigger customers, who have the financial means to pick any trainer in the world, you need to build social proof first. It’s very unlikely that any unknown trainer marching into a big office building is going to gain a new customer right then and there. Of course, if you’re actually not unknown, e.g. you have previously worked for a big company as an employed trainer, that is great. Use that connection to get hired back as an independent trainer. That’s all the social proof you need if you start calling other big companies. Otherwise, start small. It’s generally easier to get to talk to the right people in smaller companies. Go there first, do a few successful training sessions, then ask for references. Collect customer stories, work on a few case studies. Once you’ve got your act completely together you then present yourself to bigger companies, showing them the value that you can add. Can’t get your foot in the door? Consider working for training and consulting companies as a private contractor. Obviously you have to pick a training company that sends you out to a large company or corporation. Try to find out how the training company is able to land deals with corporations. If the training company is a small one, you may be able to copy (i.e. learn from) their marketing and sales tactics. If they’re a pretty big company themselves, though, you won’t learn much that’s relevant to you as a small contractor. To be absolutely clear here: you’re doing this to gain experience in marketing and sales and to get your name out. But you cannot pick up customers from the intermediary training company. You’d have your name out for sure, but in a very, very bad way. To get your name out in a positive way, it helps tremendously to establish yourself as an authority in your field. You do this by speaking at conferences. Nowadays, you can also use social media like LinkedIn. 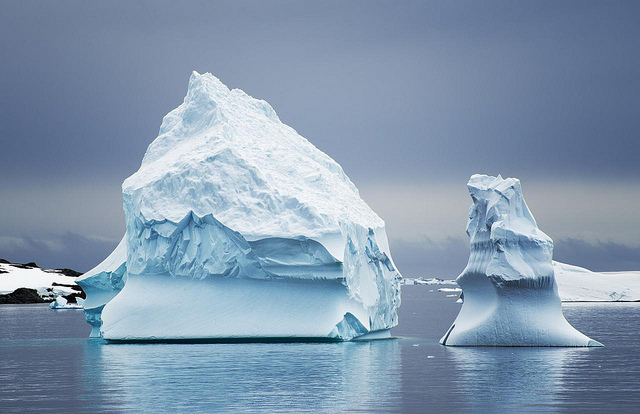 If you know which LinkedIn groups your potential customers are visiting, get involved there. Contribute to discussions and then start interesting new discussions. Based on your specialty, create a list of suitable corporate companies where you can add the most value. Visit their websites to see if they publish the names of decision makers. For training they might be hr managers. Maybe they are listed in the jobs section of the site, under ‘recruiting’ or ‘career’. If you’ve got a few names, it’s time to put on your private investigator hat. Try to find them online. See if they have published their email address anywhere. Maybe they’re visiting the same LinkedIn groups as you do. Once you’ve got their contact data, send them a message (either through email or through LinkedIn) and try to get on the phone with them. At this stage, you must have your customer stories and case studies at hand. Of course, both online and offline, the best introduction is one made by a mutual acquaintance. Ask you current customers if they know anybody else who would benefit from your training services. If you’re just starting out, especially if you’re younger, you’re guaranteed to encounter this situation. You call a decision maker in a corporation, let’s say a bank. And lo and behold, you’re actually invited for a meeting. You get there very well prepared and you have a nice conversation about the value you can add through your training. In other words: you both agree that your training solves a real problem. The hr manager smiles and nods. Don’t fall for this. Nor for any other requests for freebies. If they think your training adds value, they’ll be willing to pay for it too. Otherwise, why would they waste their employees’ time with your training? 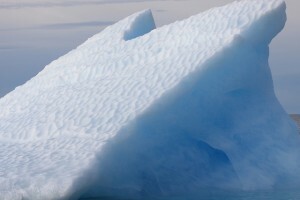 Photo Credit: McKay Savage, published under CC. The people who are hiring you, presumably the ones you identified as decision makers, are taking a risk on you. Make sure that you don’t disappoint them. What’s more, provide them with evidence that you have added value for the company, that you have solved their problem. Ideally, you start with a pre-test to measure current skills and knowledge. During the training sessions, keep accurate attendance records. After the training, test the trainees’ skills and knowledge again. If you don’t see enough of an improvement, try to pinpoint the problem and discuss it openly. This is something you should do for all types of customers, but corporate managers will want to see detailed reports from you (even if they don’t always actually read them). So, make sure that you can provide those reports. How do you find high demand, low competition training markets? If you’re looking to start a career as a trainer, this is an important question. But even as an established trainer you might want to enter more profitable markets. In both cases you’re looking for niches, or sub-categories, in the training market that are underserved. 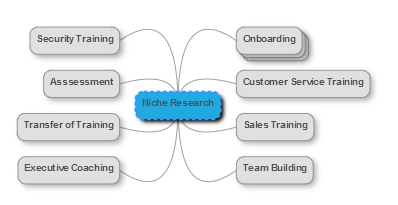 To identify these profitable niches you have to do some market research. But not the type where you invite lots of consumers in your test panels and feed them your new frozen yoghurt. Instead, we are going to explore a number of relatively cheaps tools which have become available in recent years. But first we need to talk about your passions and strengths. Not all the profitable niches you’ll identify shortly are a good match. Some may be very boring, some may involve working with people you may not like. Even if these niches have great potential as profitable markets, they may not be suitable for you. It is very unlikely that you’ll be successful in market where you have to do work you absolutely hate. To find niches which suit you, make a list of your strengths, or skills, and passions. To illustrate the difference between a passion and a skill, think about aircraft spotters. A plane spotter’s passion is obviously planes. But amongst their skills is probably not piloting a plane (or else they’d be doing that instead). A nice tool for compiling a list of your passions and skills is MindMup, an online mind mapper which lets you save your mind map to your Google Drive. Here’s an example of my list. Now, using your strengths and passions, try to come up with a list of suitable niche training markets. Don’t worry about profitability or competition, that’s something we’ll be looking at shortly. Here’s a list I compiled as an example. We now have a short list of interesting niches where you can apply your strengths and passions. 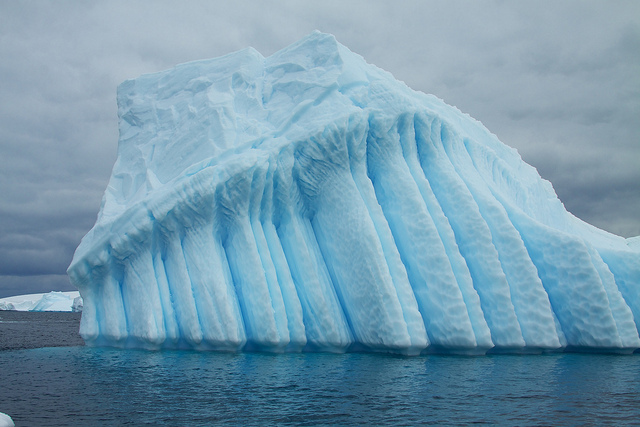 To expand your list, you could start using Google to find related niches, based on keywords. Just type in your keyword and you’ll see that Google automatically shows a list of related keywords (other search engines do much the same thing nowadays). 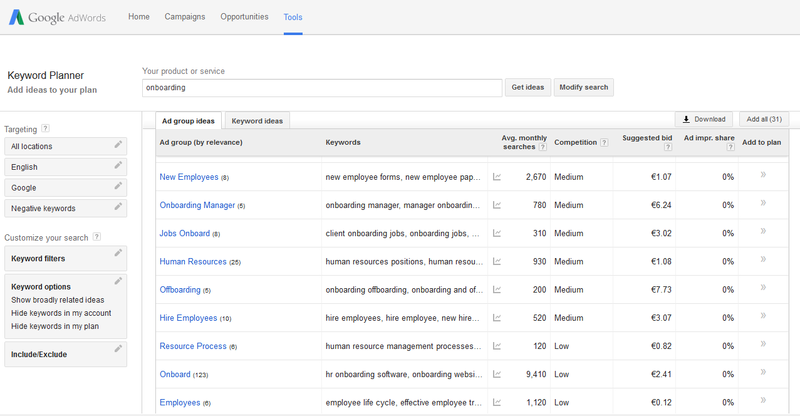 While this is a nice start, Google offers a more comprehensive tool as well: the Keyword Planner. 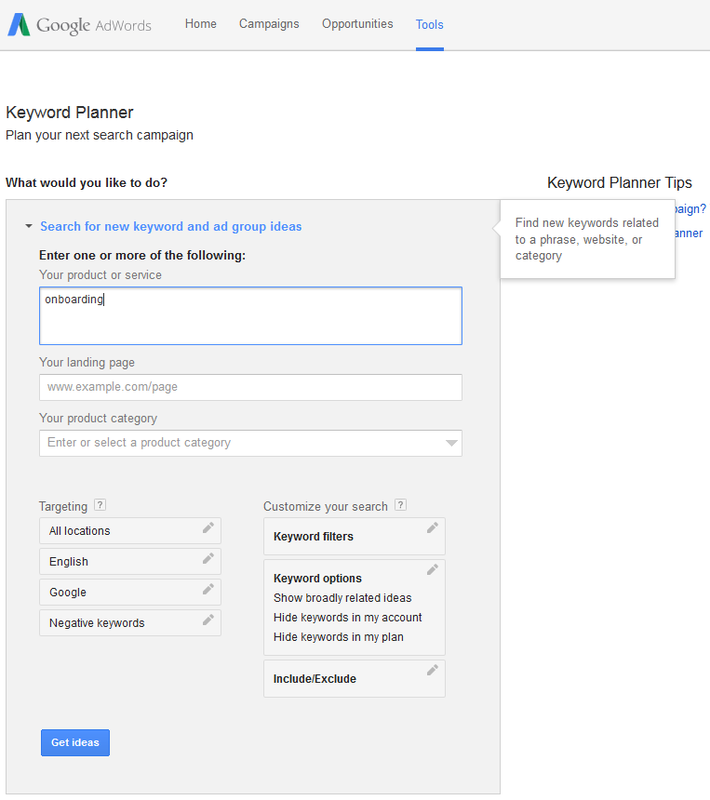 To use the Keyword Planner, sign up for Google Adwords (you may be required to input your credit card, but using the Keyword Planner is free). Enter your keyword, ignore all other options and hit the ‘Get ideas’ button. The Keyword Planner will now show you a number of related keywords, conveniently listing the competition in the advertising space as well. Keep in mind that we’re specifically talking about Google’s advertising space here: the ads that Google shows next to the search results on its regular site (called Adwords). If you plan to use Adwords, you should not select a niche based on keywords with a high level of competition. There’s one more thing you need to know. Unless you’re planning to sell your training in a location independent way, for example as an online training, you should restrict the keyword list to your country, state or even city. In the left column, click on ‘All locations’ under Targeting to enter e.g. your city. Once you’ve done that, Google will retrieve a new list and the numbers will be lower (because you’re no longer searching globally). If the search volume for your niche is high, and the competition is low, go for it! 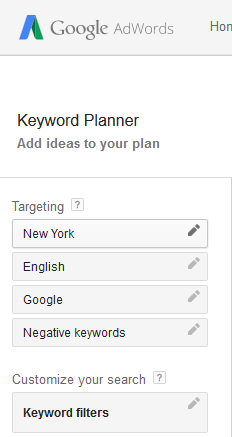 As I said earlier, the competitive analysis Google’s Keyword Planner provides, is limited to just the advertising space: for a given set of keywords, how many advertizers are out there and what are they paying per ad? While that is interesting information, you may also want to look further. Here, I’ll show a tool for analyzing the competition on the web, or more specifically their rank in search engines such as Google. This is called SEO competition, after Search Engine Optimization. SEO competition analysis tries to find out how hard it is to get on the first page in Google. So, if the SEO competition is low, then your chances of reaching the first page on Google for the keywords of your niche are good. The rational behind a competitive analysis based on SEO competition is that everybody is on the web nowadays. If you find a number of related keywords with low SEO competition, that probably means there’s also little competition in the ‘real world’. And even if that assumption is not true, it still means you have found a marketing channel that is underutilized by your competition – allowing you to reach that niche cheaper than they do. First of all, you could probably gather all the data you need by just using Google. However, there are various tools which make life easier by saving you a lot of time. I have tried two of them Jaaxy and Market Samurai. I found Jaaxy to be… lacking in features. For instance, if you’re looking for related keywords, Jaaxy will come up with a nice table showing the keywords, the monthly searches and the competition, but the columns in the table cannot be sorted. Also, the trial version is limited to just 30 searches and even then imposes some additional constraints. Market Samurai is a much better SEO competition analysis tool. 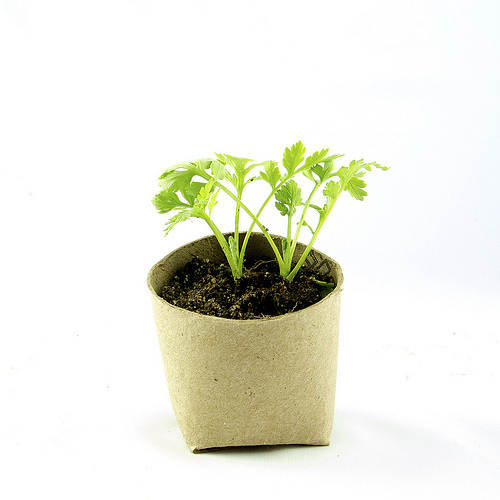 The trial version is completely functional and provides real value. The only drawback here is that you need to input you Adword account data – which is usually your Gmail account. So, in the background, Market Samurai is using Adword data to perform its analyses. Because Market Samurai is so much better than any of the other tools (that I know of) out there, I’ll include a brief tutorial on Market Samurai here. If you know any better tools, please let me know in the comments. 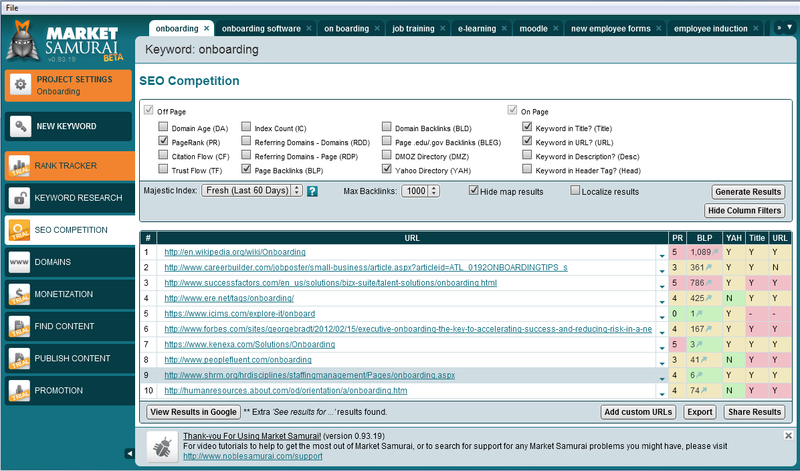 Market Samurai is a tool that lets you analyze the SEO competition. You can use Market Samurai to find a niche in the training market where the demand is high and the competition low. There’s a nice video introduction, but using the tool for the first time can still be overwhelming. Here’s what is most important. You start by inputting your main keyword and then generating additional, related keywords. 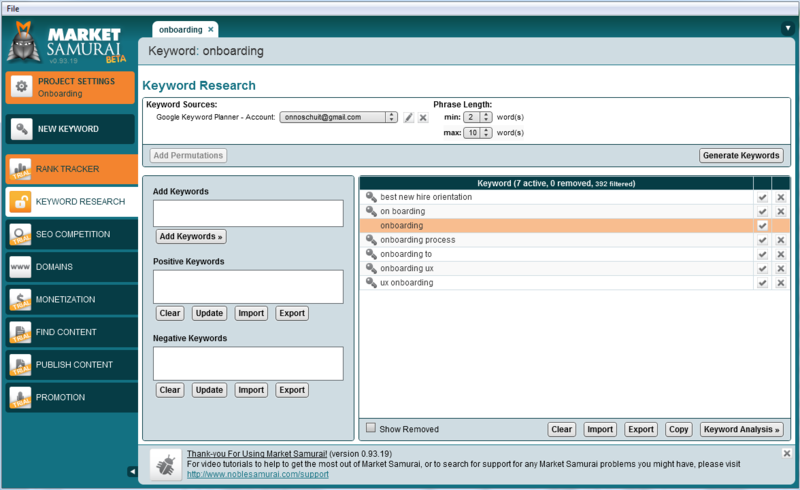 Simply click the “Generate Keywords” button to do that. Once Market Samurai has retrieved a number of related keywords, you can have these analyzed by hitting the “Keyword Analysis” button. Total Searches – How many people enter this keyword each day, on average? SEO Traffic (SEOT) – The maximum potential daily clicks that a number 1 ranked site for this keyword term could potentially achieve. Using the check boxes, you can uncheck all the other columns. So, what have we just learned? 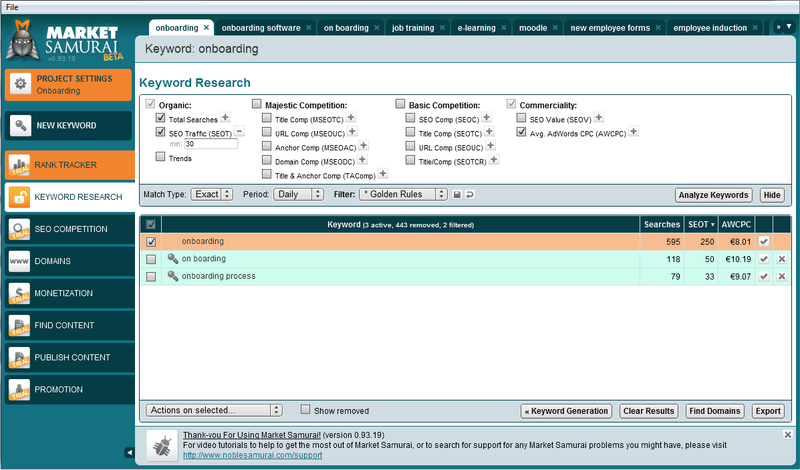 Well, the keyword ‘onboarding’ is promising in that, worldwide, quite a few people search for it every day. On the other hand, advertising through Adwords would be very expensive indeed: $8 per click on your ad. That’s a whopping $2000 a day (250 SEOT x $8). This is not within our budget, so we need to know if we can make it to the first page of Google with our site, when people are searching for onboarding, because then we won’t need any advertising. Select the SEO Competition menu item to find out how other sites are ranking for the term onboarding (or really any other training related keyword, of course). Title: is the keyword in the title? URL: is the keyword in the URL? Together, these metrics will give you a good indication of how easy (or difficult) it will be to enter the top 10 search result with your website, for the selected keyword. If you see a lot of yellow and red here, you’d better start looking for another keyword to find your training niche. Tip: compare the competitive analysis of a new niche (keyword set) to a market you already know intimately. For instance, I happen to know (from experience) that the e-learning market is highly competitive – both in the real world, in the Adwords advertising space, and in Google’s index. So, if you put the keyword e-learning (or preferably your competitive market’s keyword) through Market Samurai’s SEO competition, you’ll get a feeling for what those yellows and reds (see screenshot) really mean. 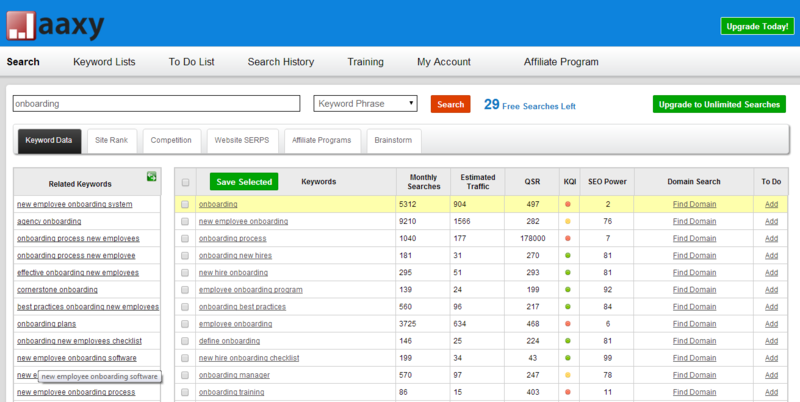 Identify low competition, high demand keyword sets with the help of SEO competition tools. Of course, once you have identified a great niche the real work starts. Talk to potential customers in the niche market. Put up a website centered around the keywords, specialize in this niche, learn new skills if necessary. Good luck and have fun! Are you a new independent trainer wondering how to get clients? You’ve come to the right place. Here’s a beginners’ guide to getting clients for your training business. First of all: congratulations on your decision to make it as a trainer! You’ve got a wonderful time ahead. You’ll meet a lot of new people and get to make interesting and important decisions. One of the most important decisions is: what will your focus be? I know you want to take on as many assignments as you possibly can. And that’s okay – in the very beginning. Here’s a tip: call established training or consulting firms and see if they have any gaps where you can fill in as a freelance trainer.